Our beach guide provides a reference to the beaches near your chosen holiday location. Choose from a range of fine golden sandy Blue Flag beaches that North Devon offers, Croyde beach is popular for its surfing conditions while Woolacombe beach is known for its traditional holiday. The most common search query is those browsing for good quality coastal beach cottages, North Devon offers an idilyc location for its array of picturesque coastal walks and its variety of beautiful beaches such as Croyde Bay, Saunton Sands and Woolacombe Bay. Choosing a coastal cottage you can experience the coastal breeze, walk to the beach and perhaps enjoy a sea view, we at Croyde Holidays are here to ensure your requirements are fully met. 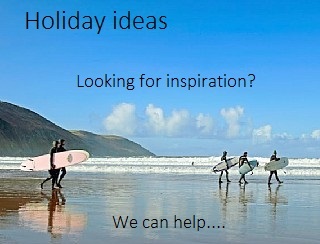 Beach holidays in Devon are a whirlwind of entertainment suited to all members of the family. Croyde Bay beach was recently awarded with the blue flag award because of its beautiful soft sand and stunning landscape its a wonderful choice when browsing our coastal cottage selection. Sit back and watch the children play in the sand or sea while the adults relax in a deckchair soaking up the sun and reading a good novel. Equally as spectacular are the delights of Saunton, Putsborough, Woolacombe and Westward ho all suited for learning the art of surfing, a round of volley ball or chill and take in the atmosphere of beach life. Beach Breeze overlooks the beautiful sands of Croyde beach, 2 Bedroom annex that sleeps 4/5 has wonderful views from the private patio and provides a modern decor and mezzanine master bedroom. The Swallows is a stylish open plan designed chalet situated in a popular location in Croyde with only a short stroll through the dunes to Croydes famous sandy beach and the village. Dog friendly sleeping 6.